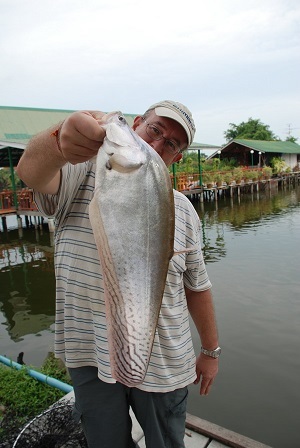 Bangkok angler Brendan once again ventured to Now Nam Lake near Bangkok. Fishing a short afternoon session, Brendan offered small ornamental livebaits close to structure surrounding the lakeside. Brendan caught a succession of Spotted Featherbacks in addition to a variety of native species. Brendan’s session was topped off by an extremely rare Blanc’s Striped Featherback weighing 2.5kg’s.